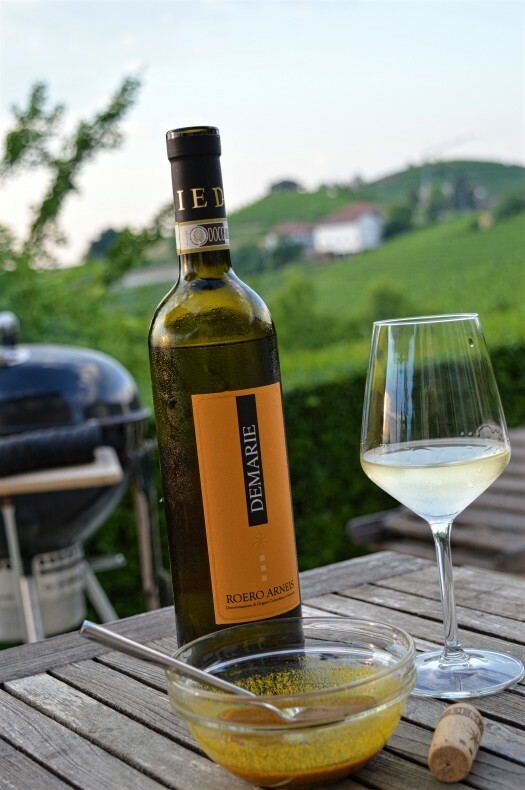 Arneis food pairing – hot off the grill and perfect for summer. In June I took the hosting duties for Wine Pairing Weekend, my monthly wine and food pairing blogger group. I picked a wine from my adopted land of Piedmont in Northern Italy. Those familiar with my ‘hood know that it’s a red-dominated wine region. Since it’s summer it seemed like the perfect time to introduce Arneis, an indigenous Piedmont white grape. And, since it’s heating up it had to be a summer Arneis pairing. In the summer Il Marito and I do a lot of grilling. Well, okay – Il Marito grills, I chop veg and quality assure the wine. His masterpiece recipe this grilling season is chicken topped with a sauce mixture of melted butter, curry powder, and fresh squeezed lemon juice (complete recipe below). The light sauce works well over chicken – breast or thighs will do. After trying both we prefer the juicier thighs. Prepping the sauce – fresh is best! 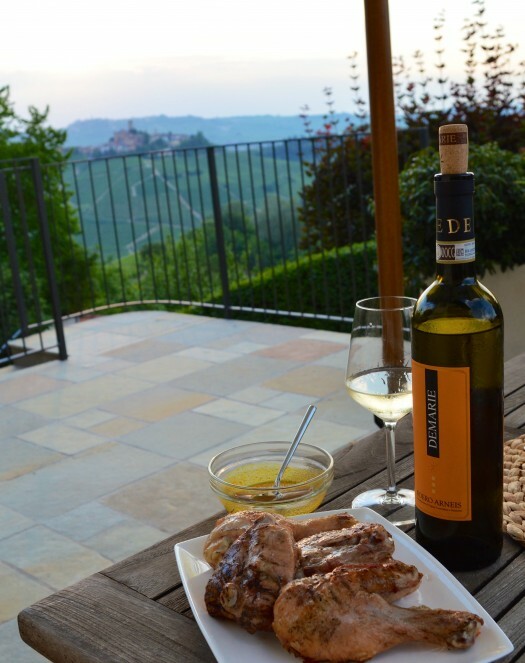 Nothing like a little wine, grilled chicken, and a Castiglione Falleto sunset. Cheers to the summer! Why Arneis from the Roero? I selected Azienda Agricola Demarie from the Piedmont winemaking area of the Roero – the left side of river from Barbaresco and Barolo. In addition to delicious Nebbiolo (and Barbera and Dolcetto…), the Roero produces the best expressions of Arneis. Winemaker Paolo Demarie explained that the sandy soil has some clay and is rich in sea fossils giving it more minerality. This keeps the color more neutral, which generally means a fresher tasting wine. The sand also keeps the soil dry, which keeps the sugar levels just right. The wine is medium-bodied with medium acidity. On the palate it showed green apples and white blossom fruit. The fruit characteristics perfectly complimented the juicy chicken’s barbecue flavor. The acidity of the lemon nicely supported the wine’s fruit flavors. Get your own bottle of Demarie Roero Arneis! Demarie Roero Arneis and Langhe Arneis can be found the U.S. Find them on wine-searcher, or if you make it to our neck of the woods come by the winery for a tour and tasting. I betcha a bottle you’ll take something home! 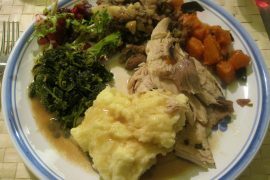 Find the full recipe and links to the rest of the group’s Arneis food pairings below. If you’ve got questions on this summer wine leave us a note below! Or, hit us up on today’s Twitter chat #WinePW. Cin cin! Roero Arneis by Azienda Agricola Demarie. 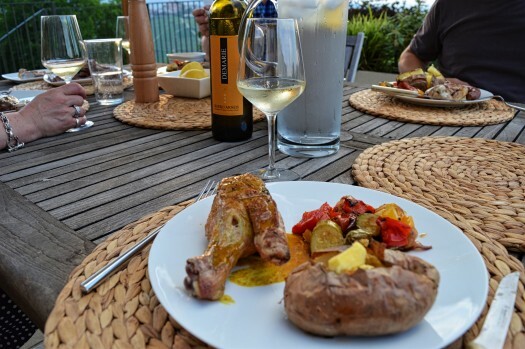 June Wine Pairing Weekend Round-up: More Summer Arneis Food Pairing Recipes! We’ll be talking about Arneis and summer wine pairings later today during our Twitter chat at 11:00 a.m. ET. 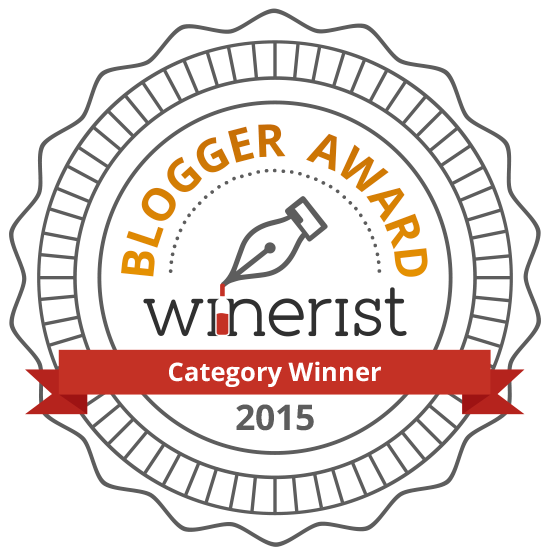 Follow the hashtag #WinePW. 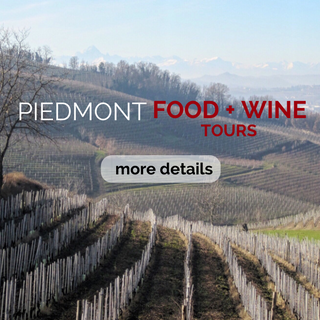 Wine Pairing Weekend July: Join us next month! In July Americans celebrate Independence Day and the French celebrate Bastille Day. July’s Wine Pairing Weekend will take place on Saturday, July 11, led by Michelle Williams of Rockin Red Blog. The group will explore food and wine pairings from the United States and France. From Michelle, Get creative and make your favorite all American food and wine meal, your favorite all French food and wine meal, one of each or a combination of both! With these two regions the sky is the limit! A super simple summer recipe that makes for a great Arneis food pairing. Fire up the grill. Lightly salt and pepper the chicken. Grill the chicken for about 15 minutes, turning occasionally. If you use chicken breasts or boneless thighs reduce the cooking time by about three to five minutes. The sauce only takes about five minutes so make it right before the chicken is done. 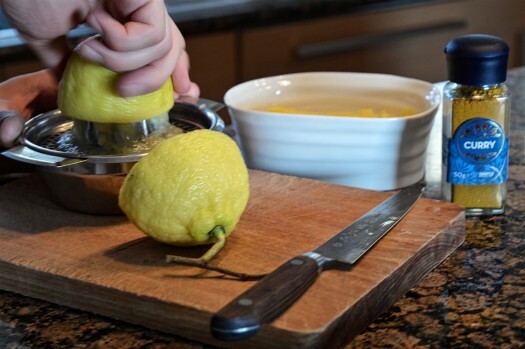 Start by juicing half a lemon (use more if you want a more tangy sauce), then melt the butter on the stovetop. Add curry powder and lemon juice to butter, salt and pepper to taste. Serve hot. Pour over chicken thighs. We finished our meal with grilled vegetables and baked potato. Vegetable dishes area always a great Arneis food pairing. 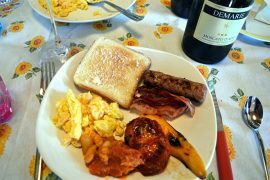 Moscato Food Pairing: Moscato For Breakfast, Anyone? 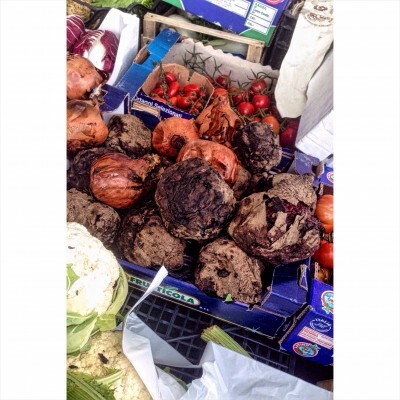 What wine pairs with beets? Previous articleWine Pairing Weekend Preview: #SummerOfArneis is coming up! 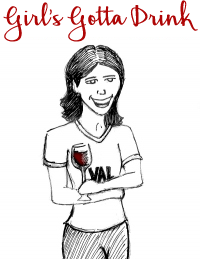 Subscribe to Girl’s Gotta Drink! Follow Girl’s Gotta Drink on Facebook!